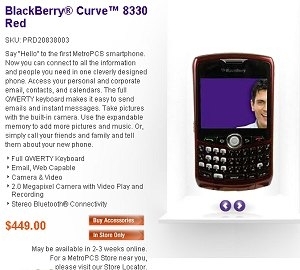 MetroPCS offers BlackBerry Curve 8330 | BlackBerry Blast! Furthering its commitment to provide the most economical unlimited wireless services available to consumers, MetroPCS Communications, Inc., launches their first BlackBerry® CurveTM 8330 smartphone from Research In Motion. Featuring a full-QWERTY keyboard and advanced multimedia capabilities, the BlackBerry Curve 8330 is an ideal smartphone for customers that want to stay connected to the people and information that matter most.